MGM Grand Resort & Convention Center ~ Las Vegas, Nev. The AEA Trade Show is the platform of choice for the introduction of the new avionics products for 2013. 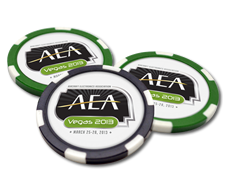 The AEA Convention at your fingertips! Mobile App is available to assist convention attendees on the go. Advanced registration for the convention has closed. On-site registrations & event tickets will be available, during convention, at the registration desks located at the MGM Grand - Grand Ballroom foyer. * Dailys do not include event tickets. Additional $50 to daily rate for non-members.